The HistoryMakers has had a long and deep connection with K-12 teachers and classroom instruction. 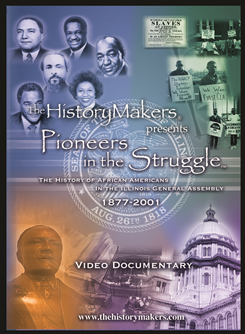 Its educational initiatives and curriculum materials for K-12 education have included The HistoryMakers Digital Archive, ScienceMakers, Pioneers in the Struggle: The History of African Americans in the Illinois General Assembly (1877-2001), FutureMaker: Becoming a HistoryMaker, the National Endowment for the Humanities (NEH) Summer Education Institutes and an Institute of Museum and Library Services (IMLS)-funded program that trained African American archivists. Content critical to identity formation in underserved minority youth. Created with a National Science Foundation grant, ScienceMakers Toolkits are great for use in the classroom. Easy to use and featuring the lives, careers and scientific work of 211 of the nation’s top African American scientists, your students will be asking for more. There are three volumes of the toolkit, and each volume has featured biographies to allow students to compare their background with that of the scientists. They also include easy to use experiments and activities, discussion questions, suggested video clips that are found in the ScienceMakers Digital Archive and much, much more. The first volume contains biographies of 34 ScienceMakers and is packaged with a companion DVD including clips of each ScienceMakers' interview. Featured ScienceMakers include Warren Washington, Larry Gladney, and Darnell Diggs. The second volume contains biographies of 73 ScienceMakers and five classroom activities per featured STEM discipline. Featured ScienceMakers include Neil de Grasse Tyson, Dawn Wright, and Shirley Malcom. The final volume contains biographies of 96 ScienceMakers and extra fun facts about each ScienceMakers' work. Featured ScienceMakers include Charles Bolden, Lonnie Johnson, and Linnaeus Dorman. >1) The struggle for civil rights and against discrimination – both de jure and de facto – opening with the early struggles for basic citizenship, moving to early representation, and then to the struggles for equality in public accommodations and employment. 2) The role of the legislative branch in both winning and enforcing civil rights, in addition to exploring how minorities can use the legislative process to create societal change, as well as the dynamic between elected representatives and the political participation of individuals, communities, and grassroots groups. 3) The historical stages involved in the African American community’s struggle to gain sufficient political power to successfully struggle for its own interests, tracing from the development of early leaders, to patron-client relationships, to the professionalization of elected leaders, to independent political action as manifested in the Independent Black Legislative Caucus. FutureMaker: Becoming a HistoryMaker is a literacy development curriculum that can strengthen learning across various disciplines, and is primarily focused on both developing Common Core Literacy Competence and on increasing positive social-emotional development. The curriculum guide and teaching resources are organized in two parts: “Quests,” projects that emphasize integrated and applied literacy competencies aligned with Common Core Standards, and “Learning Guides,” activities that can be completed as independent activities or integrated into the quest projects. In FutureMaker: Becoming a HistoryMaker, students analyze the past and students apply skills and strategies aligned with Common Core Literacy Standards as they analyze biographies presented in first-person narratives, synthesize information from different primary and secondary sources, and envision the future. The students reflect on themes of determination, leadership, adversity, resilience, and community. Students relate the ideas and role models they learn about to themselves. Teachers can adjust the activities to meet the learning levels and interests of each student. Michael Diluzio’s classes conducted a comparative analysis of two different oral history stories from The HistoryMakers Digital Archive from a playlist that Diluzio had pre-selected, to supplement and enhance their study of World War II. Students recorded specific historical information from the oral histories, as well as information about how the interviewer interacted with his/her subject. Students then answered questions that encouraged them to analyze the oral histories as a historical source. They also completed a KWL chart (Know – Want to Know – Learn) as a content-based formative and summative assessment for the lesson. Mary Patton asked her students to do a research paper and directed them to use The HistoryMakers Digital Archive as the focal resource. Her objectives were to both provide students with an opportunity to practice their research skills (like Boolean search and identifying reliable sources) as well as to improve their digital literacy. Students picked their topic from a list Ms. Patton provided, and utilized evidence from testimonies provided by The HistoryMakers as well as an additional primary source to develop a thesis and subsequently write a research paper on their topic. Juanita Douglas, an honors social studies teacher at Lincoln Park High School in Chicago, Illinois, has been integrating The HistoryMakers content into her classes since 2001. She uses the rich storytelling available in The HistoryMakers Digital Archive to enhance her critical thinking pedagogy. The HistoryMakers Digital Archive requires students to appraise evidence and evaluate positions based on the personal story and perspective of the leaders, leading to a richer understanding of historical events as it relates to prior knowledge. Douglas tied this assignment on Chicago neighborhoods to the Honors African American History Social Science Fair, allowing her students to use the archive as a source for stories and history related to their local community. Monny Cochran’s class used The HistoryMakers Digital Archive as a tool for his students to explore the decade of the 1930s in U.S. history. He first asked students to define some key terms from the period, and recount what they already knew about the African American experience during the Great Depression. After that, students examined 2 topics (assigned from a list of pre-selected topics) using material from The HistoryMakers Digital Archive. They used the information they found via their research to create a historically accurate dialogue between two African Americans about that period in American history. They then had to create a flow chart that diagrammed the two speakers’ shared historical experiences. Robin Wanosky’s classes used The HistoryMakers Digital Archive in the context of their study of the 1920s. Students were asked to consider what they already knew about the 1920s in America, and were then asked to explore the contents of the archive by first searching “1920s” and searching within those results for any two of the following terms: Great Migration; Harlem Renaissance; life in the 1920s South; life in the 1920s North; KKK. They had to watch at least 15 minutes of content in each subject area (they were not restricted to a certain number of speakers), and were instructed to fill out a chart comparing the content from the two topic areas. Robin Wanosky’s Advanced Placement U.S. History students engaged with The HistoryMakers Digital Archive in a project she created requiring students to explore oral history as a type of historical source. Students had the option of either using oral histories from the archive or conducting their own. Those who chose to use The HistoryMakers Digital Archive were advised to do so topically, then to write and answer a research question based on its contents. Students who conducted their own did so based on a pre-approved historical topic. The alternate perspective provided by the contents of The HistoryMakers Digital Archive engaged and impressed students, and deepened their understanding of how the historical record is created. In 2014, The HistoryMakers received a $1.6 million grant from the PricewaterhouseCoopers Charitable Foundation, to process and upload a backlog of 2,000 video oral history interviews to The HistoryMakers Digital Archive – with the aim of providing a robust, one stop Digital Archive that could serve as a critical new resource for teachers. As part of that grant’s requirements, The HistoryMakers contracted with Goodman Research Group, Inc. (GRG) to conduct an external evaluation to assess the effectiveness of the fully populated Digital Archive. Conducted over a period of three years, the first year of evaluation was comprised of case studies of two schools that each had at least one teacher who had used the Digital Archive in the past, and intended to continue use with students. Evaluation included key stakeholder interviews with educators, classroom observations with in-person interviews, and student pre- and post-surveys. Plans for Years 2 and 3 included pre-post student surveys and post-only teacher surveys, with as many schools as possible. The intent was to examine the effectiveness of the expanded reach of the Digital Archive. Both telephone and in-person interviews were conducted with educators and administrators familiar with the Digital Archive, to learn about their use and experiences with the resource, observed three classrooms of students as they used the resource independently, and developed and pilot-tested pre- and post-student surveys in the two case study schools. The piloted surveys were intended to provide preliminary information about student response to the resource and to determine potential effectiveness of the pre-post method for use in Years 2 and 3 of the evaluation. Student pre-post surveys and teacher post-only surveys were disseminated to all of the schools that committed to using the Digital Archive during the 2015-2016 Academic Year. A field researcher observed a classroom of students using the Digital Archive at a high school in High Point, NC. In all, 1,995 student pre-surveys were completed by students in 32 schools and 197 student post-surveys were completed by students in nine schools. Twenty teachers completed the post-survey at the end of the school year, including the teacher whose class was observed by a GRG-trained field researcher. Student pre-post surveys and teacher post-only surveys were disseminated to all of the schools that committed to using the Digital Archive during the 2016-2017 Academic Year. In all, 1,034 student pre-surveys were submitted, reflecting 62 teachers across 25 schools. At the end of the year, 304 post-surveys were submitted by students in seven schools, and 23 teachers submitted post-only surveys in late spring.